These are AWESOME! In fact, they’re pretty similar to my Mini Breakfast Pizzas and Stuffed Bubble Biscuits. All three recipes include similar ingredients (bacon, egg, and cheese) but just come in different forms. With the breakfast pizzas, these ingredients are atop an English Muffin. For the Stuffed Bubble Biscuits, they are stuffed (obviously) inside of biscuit dough. 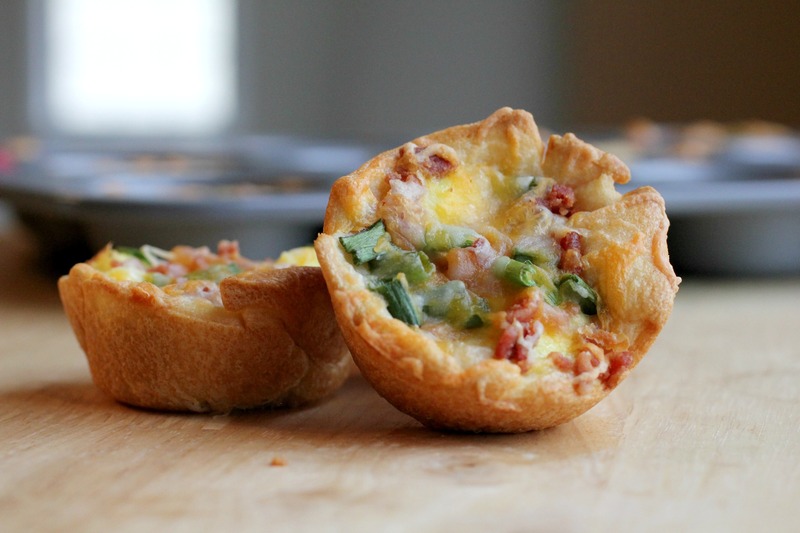 In this circumstance, however, they are baked inside of crescent roll dough in a muffin tin to make a cute little cup of breakfast food! These recipes are all similar in ingredients and flavor, but you can pick which one you like best! Or if you’re like me, you can just try all of them because you like variety :-). Another delightful thing these three breakfast items have in common is their ability to be reheated days after cooking and can all travel very easily. In other words, you could make a bunch at one time, microwave them in the mornings before work, and eat them in the car or as you’re getting ready. These are no muss no fuss and absolutely DELICIOUS! Preheat your oven to 350 degrees F and spray your muffin tin with non-stick cooking spray. You want to get good coverage of the spray inside of each of the muffin cups so everything comes out nice and easy later on. Open up your package of crescent rolls and divide the dough into triangles. It’s easiest to just lay them out on a piece of wax paper. Take the 8 triangles and place the widest part of them on the bottom of 8 muffin cups. A tail of dough should be hanging off the side. Press the dough into the bottoms and up the sides of the muffin cups. Then take a sharp knife (or kitchen scissors) and cut off the “tail” of the dough. Use the cut off "tails" to line the 4 remaining muffin cups. 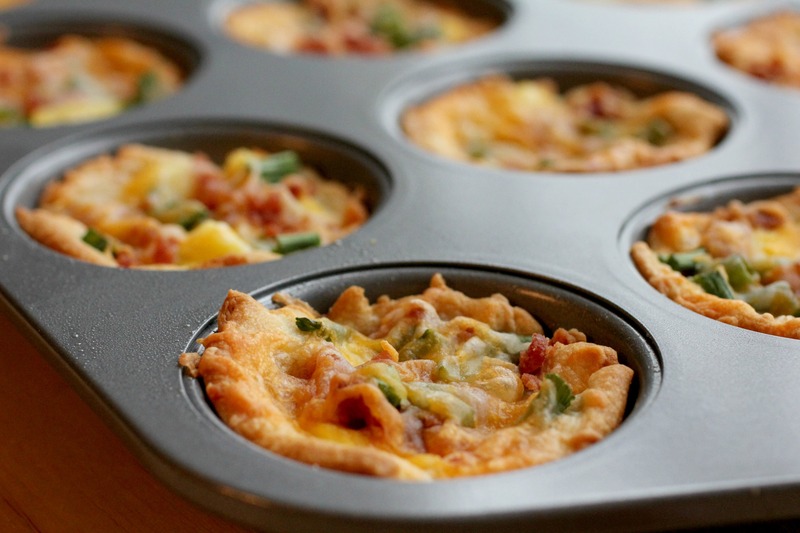 Place muffin tin in the refrigerator while you prepare the filling. Whisk together eggs and milk. Then, add salt and pepper to taste. Put your egg mixture into a non-stick skillet and cook over medium-low heat for approximately 5-8 minutes. You want the eggs to be firm but slightly runny. The eggs will finish cooking later in the oven. Take your muffin tin out of the fridge and spoon the scrambled eggs into each cup. 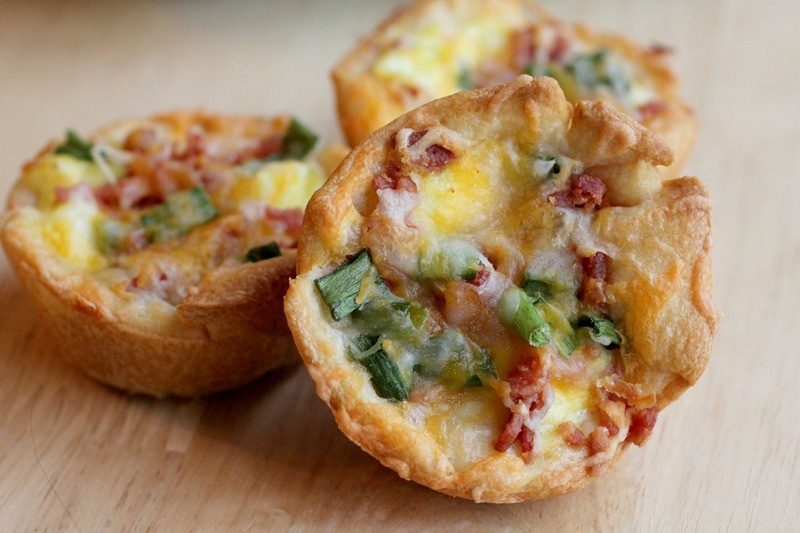 Top the eggs with bacon pieces, chopped green onions, and shredded cheese. Bake for 15 minutes at 350 F or until the edges of the crescent rolls are golden brown and the cheese is melted. You can freeze and reheat this dish. Just wait until the cooked breakfast cups are cool, then wrap them tightly in plastic wrap and place in a sealed freezer bag. When re-heating in the microwave it may be best to wrap them loosely in a paper towel to retain moisture. This is such a great idea I’m definitely making these for my boyfriend this weekend so he can take breakfast to work with him! Thanks Lauren! Hope y’all like them as much as we did! These are delicious! I found your recipe through google. I made it with sausage instead of bacon as I didn’t have any on hand. It worked out really well. Pinned this! Thanks Jamie! Glad you liked them! They’re one of my favorite breakfast meals. Hope you find many more recipes to try on my site! These will be great to fix for our camping club. Enough for everyone to get a taste. AS we have a group meals. Thanks Beverly! Hope everyone in your camping club loves it! Wonderful! Bible study and bacon sounds like an excellent morning! Thanks for sharing the calorie count, too. I am a calorie Nazi right now so I calculate everything. With regular crescent rolls the calorie count is 120 🙂 I am sooo excited to try these!! oh snap, that’s not bad at all! Especially if you use reduced fat crescent rolls (which I always do). Thanks for doing the calculation for us! These look great! I’m curious – if made with sausage, how much do you need to cook up for the recipe? Hi Hayley, that’s a great question! I’m just estimating here, but I think maybe half a pound? How would this work if done in a casserole dish or pie plate? Pat, I’m not sure how well it would work in a casserole dish or pie plate. You could try lining the pan with the crescent rolls and then topping it with the other ingredients. You would also increase the baking time. If you try it, please let us know how it turns out! Any idea if you froze them, how they could be reheated? I would love to make these in advance and then heat them as a grab and go breakfast! Well I’ve never tried it so I can’t say for sure, but I think they would be great! They probably wouldn’t reheat well in the microwave, but a toaster oven or regular oven should work. If you try it out, please let us know how it goes. Portebello mushrooms, spinach, tomato, Swiss. Potato/hash browns, bacon, green onion, American. Chorizo or hot sausage, jalapenos, red pepper, Mexican cheese blend. Hey Andy. All those ideas sound AWESOME, especially the lobster/shrimp combo. Thanks for sharing! Making these right now 🙂 using left over New York strip from J.Alexanders instead of bacon.. they look so good! Now that’s definitely upping the fanciness factor! That sounds delicious! Do we have a weight watchers points for these?? I’m sorry Christine, I don’t! I wish I did! If you put the ingredients into one of those points calculators, please let us know what the total is! I am a big fan of these but I have one question. Instead of precooking the eggs, could you precook the shells and then add completely wet eggs? Or just add it all and then bake it? You may have to cover them for a bit at that point. Just curious. Thank you!! Can these be served at room temperature? Hi Teri! These can be served at room temp. They’re definitely better warm, but they’re still good even after they’ve cooled!